South Korean chipmaker SK Hynix on Tuesday said profit in the first three months of the year boomed more than 300 percent to a record high as strong demand for memory chips used in mobile phones boosted prices. First-quarter net profit surged 324 percent on-year to 1.89 trillion won ($1.66 billion) while operating profit jumped 339 percent to 2.4 trillion won—also a record. Strong demand for NAND flash memory chips used in smartphones and other mobile gadgets, coupled with industry-wide supply shortages, pushed up prices and boosted the firm’s margins, SK Hynix said. Prices for DRAM chips—widely used in PCs and computer servers, and a key component of the firm’s sales—also rose, it said, adding demand would remain strong thanks to the popularity of cloud computing services and high-end PCs for gamers. The firm’s overall sales grew 72 percent on-year to 6.28 trillion won, another quarterly record. Shares in SK Hynix closed unchanged at 52,400 won in Seoul Tuesday after rising as much as 1.5 percent in morning trade. The company is the world’s second-biggest maker of DRAM chips after Samsung, which earlier this month flagged a 48 percent jump in the first-quarter operating profit owing to strong sales of memory chips. 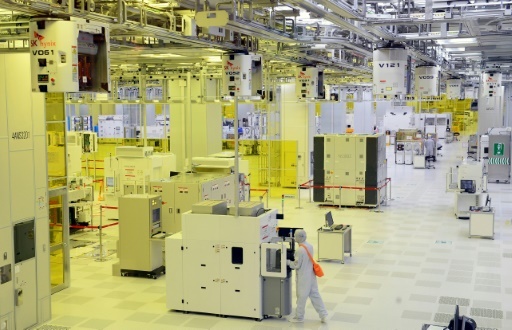 SK Hynix is in the midst of an attempt to take over the semiconductor unit of troubled Japanese tech giant Toshiba, with a consortium led by the firm reportedly offering to pay more than $9 billion. If the deal goes through, it would make SK Hynix the global number two maker of NAND memory chips. It is currently fifth.